The history of cinema in Colombia began in 1897 when the first Cinématographe arrived in the country, two years after the device was invented by Auguste and Louis Lumière in Paris. 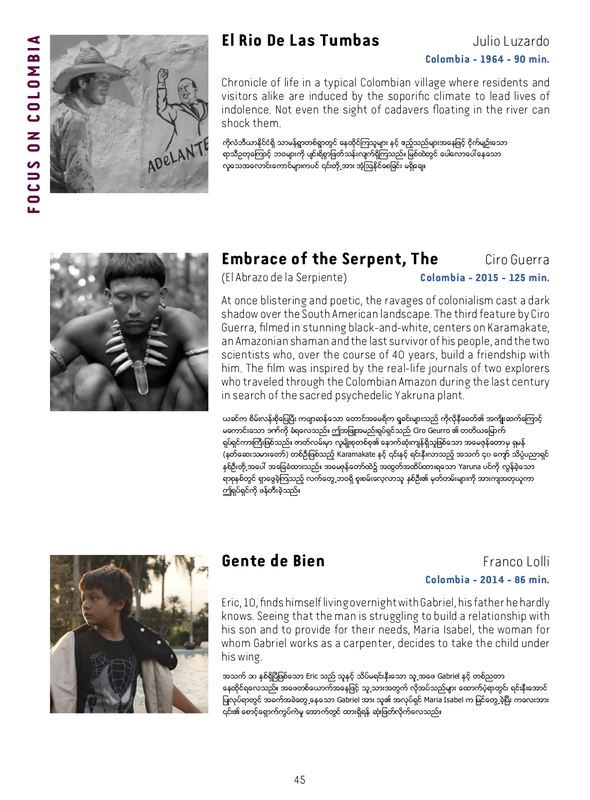 During its early age, Colombian Cinema almost exclusively portrayed nature and everyday life in documentaries. The first feature film, La Maria (1922), was directed by Máximo Calvo Olmedo and based on the novel written by Jorge Isaacs. No copies of this film have been retrieved and it is, just like the first feature film from Myanmar, Love and Liquor (1920), considered lost. Arturo Acevedo Vallarino was one of the pioneers of Colombian cinema. He shot La tragedia del silencio in 1924 and, in 1925, Bajo el Cielo Antioqueño (« under the Antioquia sky », after one of Colombia’s 32 departments). The film is, to this day, the most ancient colombian film still in existence – exactly as Mya Ga Naing (1934) by Maung Tin Maung, restored in 2016, is the most ancient Myanmar film. From the 30s onwards, with the world economic crisis, Colombia gradually stopped producing its own pictures in favor of displaying foreign ones. The country had to wait until the end of the World War II to restart its national film industry. Paradoxically, it was thanks to the efforts of Gabriel García Márquez, one of the most significant writers of the 20th century, and Enrique Grau, a prominent Colombian painter, that Colombian cinema entered its renaissance. Together, García Márquez and Grau shot a surrealistic short film La langosta azul, in 1954. Garcia Marquez continued working in the industry as a famous scriptwriter. 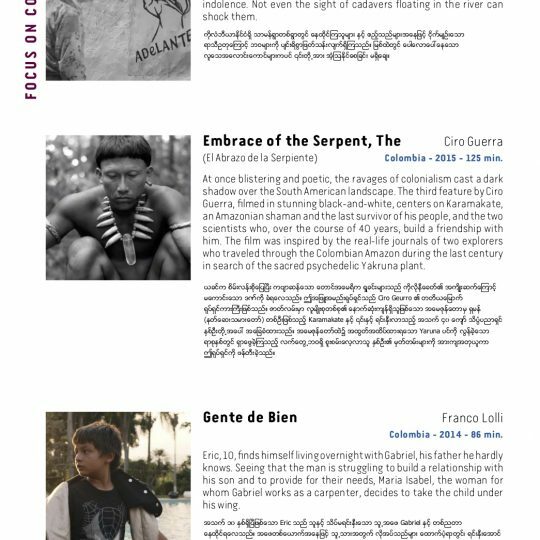 Slowly, Colombian cinema came back to life. Many notable films came out of that era. José María Arzuaga’s Raices de piedra (1961), for instance, chronicles the social ills of the « chircaleros » (brickyard workers) who lived in poor neighborhoods in the South of Bogota, the capital city. Originally a documentary, the project evolved into a feature film. It is precisely this double nature that gives the film its strength, leading to it being denounced by the censorship as a « malicious distortion of the national reality ». During the same decade, in 1964, Julio Luzardo shot El río de las tumbas. In a small village on the bank of a large river, residents and visitors alike are affected with a mysterious soporific illness that renders them indolent in the face of everything that happens around them. Even the appearance of corpses floating down the river does not really shock them. As the villagers respond with nothing but indifference to the violence that engulfs them, the film portrays the trivialization of violence in Colombian society. 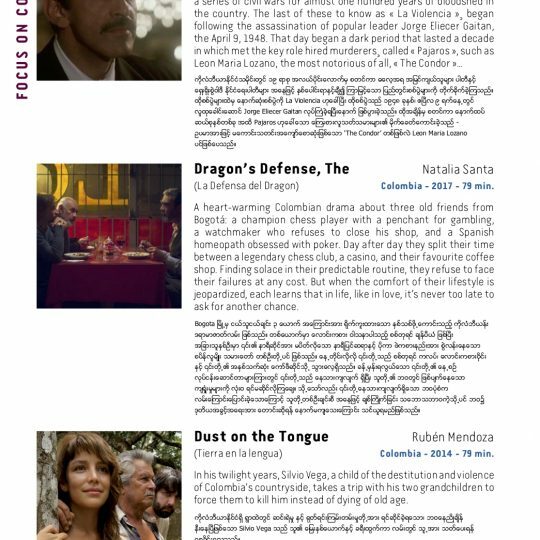 After the 70s and its wave of « Pornomiseria cinema » (a popular but criticized style of films with a high content of poverty and human misery), Colombian cinema finally became internationally recognized thanks to a few acclaimed productions. 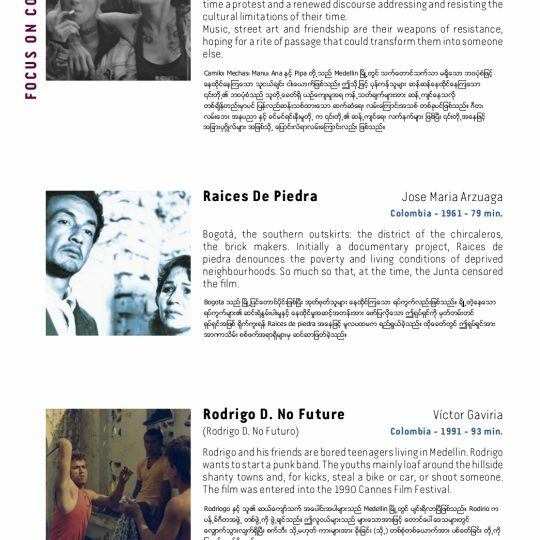 This is for example the case of two beautiful films: Rodrigo D. No Futuro by Víctor Gaviria (which was featured in the official selection at the Cannes Film Festival in 1990) and Condores no entierran todos las dias directed by Francisco Norden (Cannes selection, 1984). 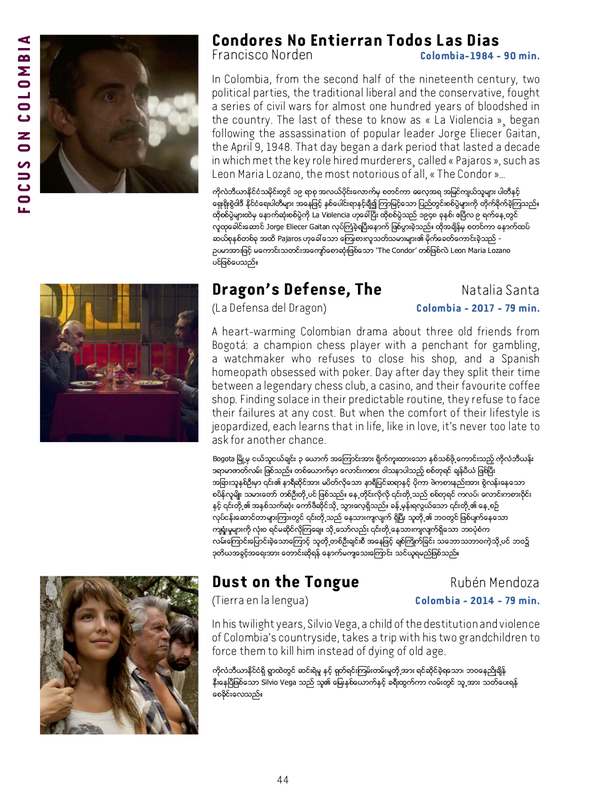 In the 21st century, the key year for the Colombian cinema was 2003 year as a film law (law 814) was promulgated to support the national industry. The new law stipulated that a tax would be collected from distributors, exhibitors and film producers to support both training needs and the production of films, shorts and documentaries. This fund is managed by the national institution « Proimágenes ». This law led to a spectacular rebirth of national cinema. 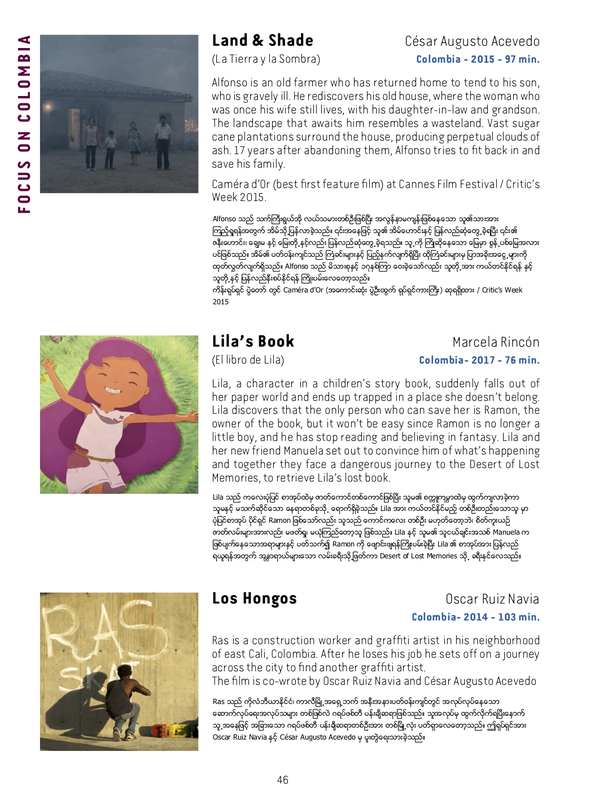 Each year, Colombian films are now selected in major film festivals around the world. We have chosen a few among the most interesting features of the recent production: Tierra en la lengua by Rubén Mendoza, Gente de Bien by Franco Lolli & Los Hongos by Oscar Ruiz Navia in 2014. El Abrazo de la Serpiente by Ciro Guerra (Oscar nomine) & La Tierra y la Sombra by César Augusto Acevedo in 2015 (Caméra d’Or). Los Nadie by Juan Sebastián Mesa in 2016. 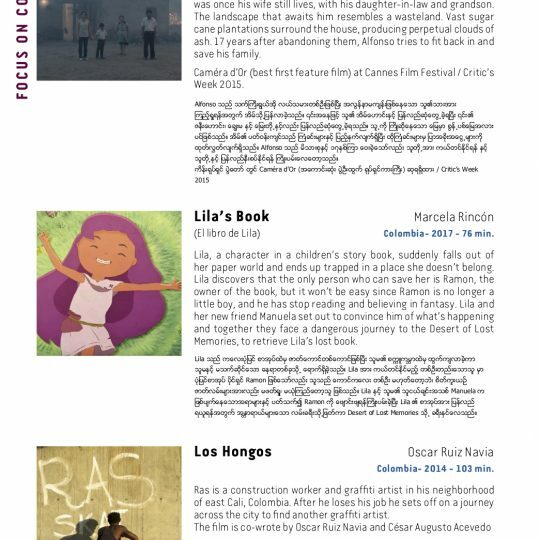 El libro de Lila by Marcela Rincón and La Defensa del Dragon by Natalia Santa in 2017. This focus was made with the valuable support of the Colombian Embassy in Thailand. The festival is particularly grateful to the Deputy Head of Mission, Juan Camilo Gaviria Betancur. 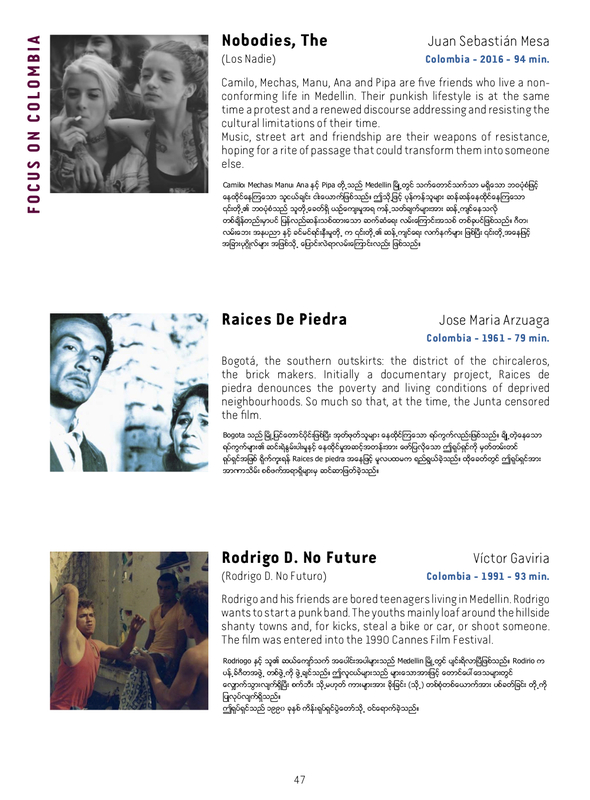 The festival also thanks Proimágenes and Fundacion Patrimonio Filmico de Colombia for their precious help. Copyright © 2017 MEMORY! International Film Heritage Festival. All rights reserved.